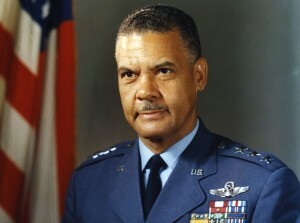 Davis was born in Washington, D.C., the son of Benjamin Oliver Davis Sr., first general officer in the U.S. Army. He graduated from West Point in 1936, as the sole African American at the academy having suffered ostracism by the corps of cadets. Trained at the segregated flight school established at Tuskegee Institute in Alabama, Davis led the legendary Tuskegee Airmen in combat during World War II. After the war, in 1954, he became the first African-American general in the USAF. In 1971, he was named assistant secretary for the department of transportation.